Pop-up whiz David A. Carter recently collaborated with Ruckus Media on Spot the Dot, a concept-learning app where users search for colored dots in increasingly complex settings. The kaleidoscopic screens of brightly colored shapes roaming around black backgrounds are exciting just to look at, but even better is the way the app engages users in interactive play. Much of the fun lies in seeking (rather than finding) the dots. 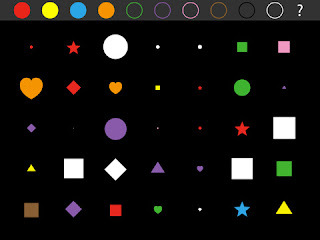 Users move a flashlight-beam–like circle to illuminate a black screen and locate the orange dot, while the green dot—alongside shapes of all colors—swells and “pops” before reappearing. David was kind enough to tell us a little about the process of making Spot the Dot. How is creating an app like creating a movable book? Creating the app was similar to creating a movable book in the sense that both are interactive; I try to integrate the interactivity into the concept. I try to avoid using the interactivity in a book or an app simply for show. You will also notice that my concepts take advantage of the hands-on nature of the medium, whether by asking a child to lift a flap to find an answer to a question or to touch the screen to move the app forward. In both cases the reader must be actively involved and use their fine motor skills. What particular challenges come with the app format as opposed to working in print? The greatest challenge in creating the app was understanding the capabilities of the device and the programming, and then figuring out how to apply the concept. With paper books, through many years of experience, I have a deep understanding of how to use paper engineering and the printing and assembly process to convey and integrate my ideas. Do apps have elements analogous to the pop-ups of a movable book? I like the fact that with pop-up books and apps, the reader is actively involved by touching the art. In both mediums we ask the reader to not only read the words and view the images but to touch and interact with the art. How does your past life as an advertising illustrator inform your current work? As an artist and illustrator I think in and communicate with images and color. In the past few years I have been using simple shapes and colors in a non-representative way, like modern art, to express my concepts. I like these non-representative images because they allow the reader to interpret the idea through their own mind. Kids will say that a pop-up looks like an ice cream sundae or a roller coaster. That’s the viewer filtering the non-representative art through their own experience. Which of the puzzles/screens are you most excited about? My favorite playspace changes from time to time, but I really like playspace nine, the black dot, because it is a bit magical. The images are invisible until you touch the screen in the right place. I also love the fact that as you touch the images you hear various musical sounds—you can play these sounds like a keyboard. I often go to this playspace just to play music. That’s my favorite, too! What would your younger self think of Spot the Dot? With the app as with my books I do exactly that: go back in my mind to little David Carter and run that test. That is what I call my “gut feeling” when decisions need to be made. I can tell you that little David Carter likes this app, especially the bright colors, surprises and the sounds, and that little David Carter can’t wait to see what’s next. Any plans for a How Many Bugs–inspired app? I am thinking about how to adapt all of my titles and ideas, including the Bug series, but most of all I’m thinking about new concepts specifically for apps that use the technology in clever and entertaining ways. I hope my art tickles your mind and as always, please touch the art. Spot the Dot is $3.99 in the App Store (or try it out with the free “lite” version). >How many bugs in a box, the software game, is still the most popular game on our preschool game computers. I love it. Non-app related: Mr. Carter, please, I beseech you, please have Scholatic re-release If you're Happy and You know it. I use it in storytime constantly!! Please! !